Late on the evening of May 15, 1928 police were called out to High Street to investigate reports of gun shots. They heard a muffled shot coming from 540 High Street, which was the home of James and Mattie Milam Jones (30) and their four children: David (11), Lola (9), Leila (3), and Clara (18 months). Upon the officers’ knocks at the door, James yelled through an upstairs window that the door was bolted and they would have to enter through a window. He eventually came to the door after coming downstairs and turning to go back upstairs holding a shotgun. Officers saw the gun & convinced him to come to the door. When he opened it, he had the loaded shotgun half-raised towards the police but they were able to get the gun out of his arms. Mattie’s “buckshot riddled” body was nearby at the bottom of the staircase. James was arrested and the children, who slept through nearly an hour’s worth of on-and-off shotgun blasts, were taken to someone named Gus Warren’s home. Mattie’s father’s took custody of the children not long afterwards but months later, an article suggested that they were in the care of some sort of charity organization. James, a tall, strong carpenter with a mangled foot and hand from an old accident, told police that he didn’t think he’d shot his wife, and if he did it wasn’t on purpose. Two alleged intruders were inside the house and he and his wife both armed themselves with shotguns for protection. These strangers had come through a hole in the floor and the shots that were fired were done so to scare them away as well as to fend off one of them who was coming up the stairs to where he and Mattie were standing in the darkness. James thought one of the intruders had shot back and after thinking that he’d shot one of the men he realized that Mattie was at the bottom of the steps, dead. He told police that the two men could’ve been the two insurance agents who had been to the home earlier that day. “Hilarious dancers were burning powder in their enthusiasm”? No autopsy was done even though there was initial question about whether Mattie was only shot once from the back with a shotgun, leaving exit wounds through her front or twice, with one shot also from the front with a pistol. 18 shots had been fired in total that night. 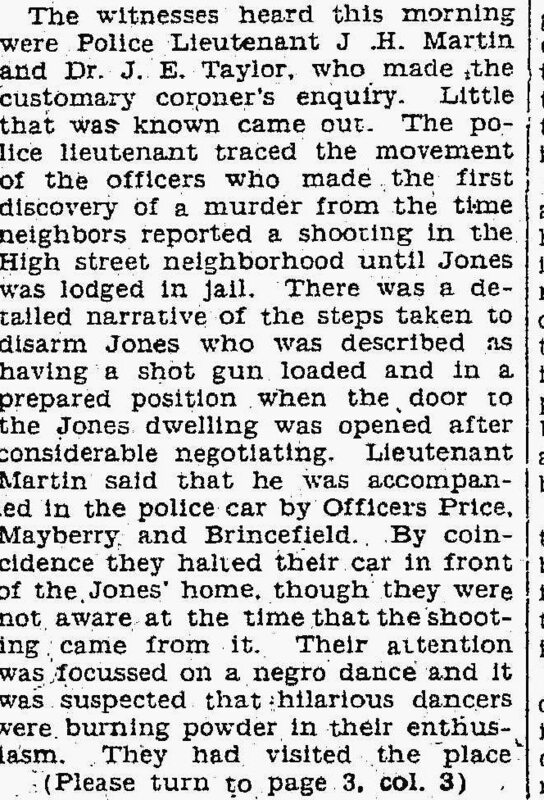 By May 17, police had determined that there were no intruders, no pistol had been used in Mattie’s killing, and there was no hole in the floor through which any intruders could have entered or fled. James’ behavior in jail prompted one doctor to suggest that he go before a lunacy commission to plead insanity. Other officials felt that he was sane when he shot his wife, although intellectually he was functioning around the level of an 8-year-old. In jail Jones claimed that his body was plagued by impulses of electricity sometimes which kept him from sleeping. Two doctors were to testify in preliminary hearings that James was sane at the time of the murder but was pretending to be insane for the purposes of eluding prosecution. Within days after the murder, their son David told his maternal grandfather, C.H. 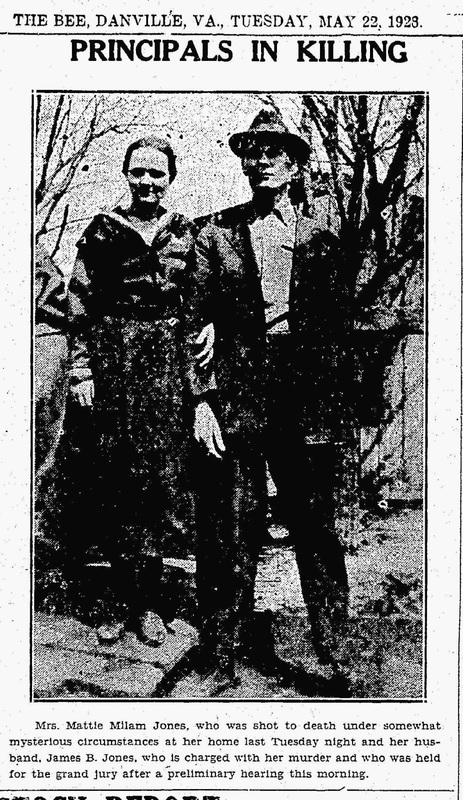 Milam, and an uncle that on the night of the murder his father had physically abused his mother and left the house, returning with a bottle of something that he made all four of the children drink. Police believed that the children had been drugged, explaining how they slept through all the shooting. During the trial David was called to the stand but upon seeing his father he began to cry and called out, “Daddy.” David, who was also considered “feeble-minded” was then removed from the courtroom without testifying. 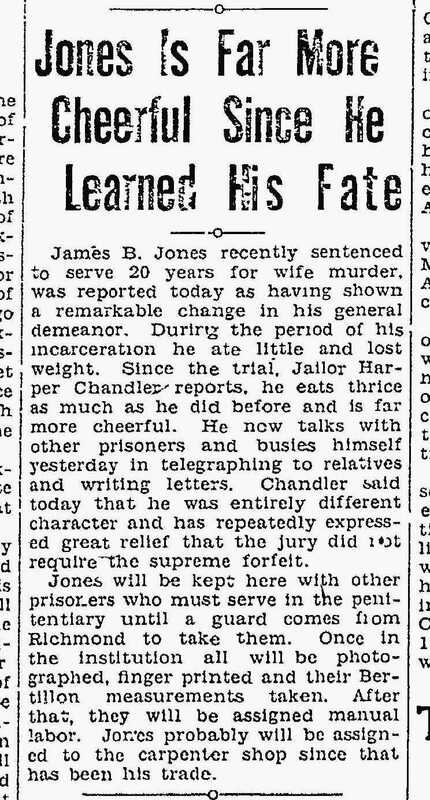 On Jan. 24, 1929 the “Danville Bee” reported that James’ demeanor had improved since receiving the verdict. Mattie’s grave is located in Danville’s Highland Burial Park. I am not sure what became of the four children or about James’ prison sentence or his life after serving time, if he was released. *This entry was originally published in 2013.